Worthologist Martin Willis discusses an unusual topic, with an entertaining guest, old-school salesman Ken Beach, talking about the history of the vacuum cleaner, recorded at the Home & Garden Show in Costa Mesa, Calif. on this latest edition of the Antiques Auction Forum podcast. Beach has sold vacuum cleaner for more than 49 years in 22 countries. 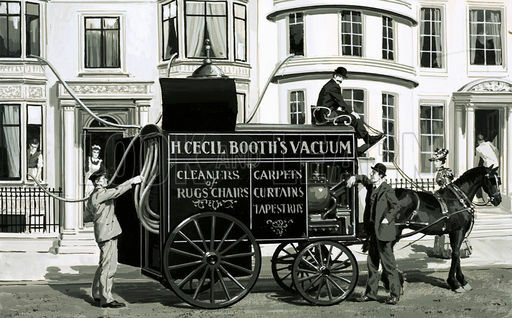 An old horse-drawn wagon carrying a gasoline-powered vacuum cleaner, with its hoses being fed through the windows of a home.